This article appeared in the Summer 2016 Good Food Exchange. Last summer and fall, people with gardens and CSAs throughout Tompkins County and beyond donated 8,268 lbs. of fresh produce to neighbors in need via Friendship Donations Network’s then 15 Neighborhood Food Hub coolers. “This year we’re hoping to collect and redistribute even more fresh food, with new hubs in Trumansburg, Ithaca’s Belle Sherman neighborhood, and at Morningsong Community Service Farm in Danby, plus the revival of a hub at Ecovillage,” says Meaghan Sheehan Rosen, FDN coordinator. “This is food that would otherwise go to waste, ending up in the compost heap or the landfill, adding to greenhouse gases,” Rosen notes. Now that reducing food waste has become an interna- tional concern, with the U.S. setting food waste reduction goals “it’s more important than ever for FDN to continue our efforts to rescue surplus food and help get it to those who need it most in our community,” she says. Huber, who also hosts a Neighborhood Food Hub at Danby Farms at 222 Bald Hill Road in Danby, says: “I continue to do it because it gives people an opportunity to make a positive difference in the community.” She says she believes that “small, positive contributions are what we need to counteract fear, negativity and selfishness around us. And of course, people receive nutritious food that they need and wouldn’t have otherwise,” Huber adds. Kerra Quinn, who is hosting a hub on her porch at 22 South Street in Dryden this summer and fall, says: “When my kids and I moved here 11 years ago we didn’t have anything. Thanks to the people running the food pantry at the 7th Day Adventist Church I was able to get my kids lots of fresh produce [from Friendship Donations Network] when we needed it.” By hosting a food hub she hopes to help others in need get healthy, fresh food today. Almost all the farm-fresh food produced at Morningsong Community Service Farm will go to feed the hungry in the community via local food pantries and programs. 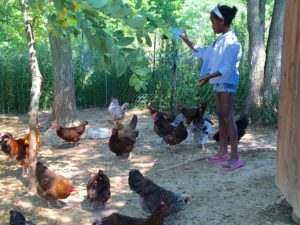 That’s the plan for the 45-acre farm at 115 Marsh Road in East Danby owned by Todd and Suzy Rose, who live there along with and their daughters, Ila, 15, and Tezia, 10, and a brood of contented chickens—and who have teamed up with Friendship Donations Network to make a difference. On Wednesdays the farm hosts an FDN food hub, a large cooler on the corner of Hornbrook and Marsh roads, where neighbors can donate excess fresh food from their farms and gardens, which the Roses then deliver, along with their farm’s food donations, at the end of the day to Friendship Donations’ headquarters in the Just Be Cause Center at 1013 West Martin Luther King Jr. / State St.
“We felt moved and inspired by the article about FDN founder Sara Pines in the Ithaca Times last year,” Todd says, referring to “Zero Food Waste,” by Josh Brokaw in the November 25, 2015, issue, which told the story of Friendship Donations Network. At the same time there was a concert at Community School of Music and Art to benefit a new food pantry in Lodi, recalls Todd. “Barb Smith wrote a powerful essay in the program about that — personal stories about children she’d encountered facing real poverty and food insecurity. We were moved and inspired to do something. “We’ve been homesteading for our own needs for a while. We asked ourselves, well, what if we just produced food to give away to those who need it? That felt really right and energized us,” says Todd. “Eggs are among the most nutritious food on the planet, and something that almost everyone likes, including kids,” says Todd. They are espe- cially welcomed at food pantries because they are not commonly donated in quantity by super- markets due to their long shelf life, he explains. Tezia feeding some of the farm’s chickens. The farm currently has 50 chickens, some that are already laying and some that soon will be. The Roses hope to raise that number to about 100. With more hens, “we’d be able to donate 30 dozen eggs a week,” estimates Todd, who says the farm also welcomes volunteers as well as monetary donations (for info see www.morningsongcsfarm.org). “Everybody you talk to wants to help, share, help kids get food and make helping kind of contagious,” says Suzy, who also notes the farm will contribute fresh produce and herbs. For information and a full list of food hubs and their schedules see: https://friendshipdonations.org/hubs/. 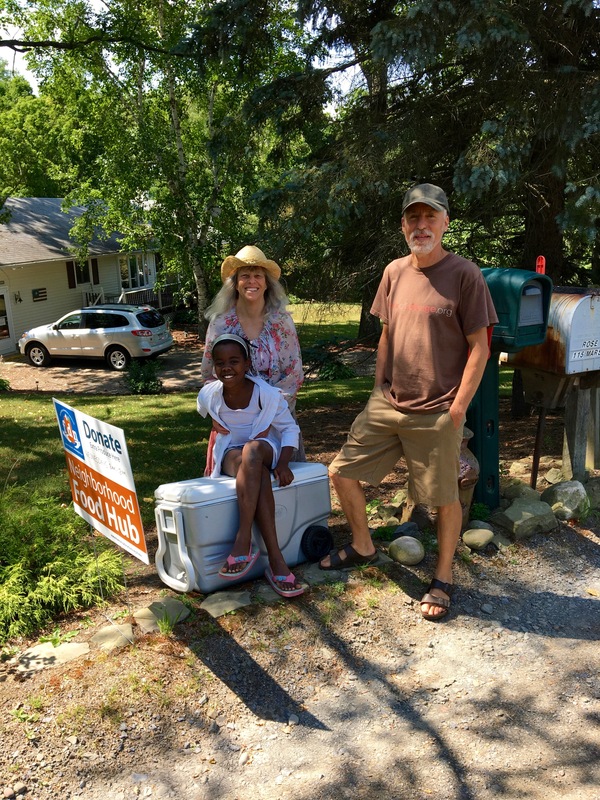 Caption for featured photo: Todd and Suzy Rose and their daughter Tezia at their Wednesday FDN Neighborhood Food Hub at Morningsong Community Service Farm in Danby.